I've carried a concealed handgun since moving to Indiana back in 1999. Before moving to Indiana I lived in Illinois that unfortunately didn't allow for concealed carry by average citizens. Over the last 13+ years of carrying concealed I've owned at least 30 different holsters of various types. First, let's talk about materials used in the construction of holsters. The two most popular materials currently in use are leather and Kydex. Both materials have their positive attributes and their negative attributes. Leather can mold itself to your body and to the firearm making it the top choice for comfort. Leather also has a traditional look that is both classy and practical. Leather is quite durable and if taken care of, can last you a lifetime. The only downside to leather, cowhide in particular, is that it can hold moister against the firearm. Horsehide tends to repel moisture better than cowhide and High Noon Holsters offers horsehide as an option. Kydex is the latest and greatest innovation in firearms holsters. It's durable, lightweight, cost effective and practical. It doesn't hold moisture and requires little or no maintenance. The downside to Kydex is that it's not all that attractive to look at and once molded into its final shape, it's inflexible. I've also noticed with many of my Kydex holsters that deploying the firearm silently isn't possible as the holster makes dragging sounds and clicks as the firearm is drawn. In some situations this might not be desirable. When shopping for that ideal OWB holster I had a few design features that were important. The holster had to be made of leather. I wanted something that would look classy should I take my jacket off. I also wanted a holster that would allow me to quickly and easily remove the rig from my belt without much hassle, including from the seated position in a vehicle. I decided against a paddle holster as they tend to sit too far away from the body and are less than ideal for concealment in my experience. This lead me to the High Noon Holsters website based upon positive reviews that I've read online. I quickly identified the Snapper as the holster I wanted to order. The Snapper is made of leather and features two leather straps that secure it to your belt via high quality directional snaps. After placing my order for the cowhide Snapper and a leather belt I anxiously awaited the arrival of my package from High Noon Holsters. It arrived very quickly. Upon opening the box I was greeted with the familiar aroma of quality leather. The first thing I noticed was that the quality of the holster was obviously top notch, this wasn't your average mass produced leather holster you see at the local gun shop. The Snapper is constructed of two pieces of leather that are stitched together using a heavy weight thread. The outside of the holster is smooth with a nice grain while the inside of the holster has the "rough" side of the leather exposed. This helps to grip the pistol thus keeping it securely in the holster. The Snapper is an open top holster design, which means the pistol is held in by friction alone. The leather of holster is .18" thick making it reasonably rigid and resistant to deformation and the tension screw allows me to easily adjust the grip of the holster. The leather belt is a very thick .32" and works perfectly with the Snapper. The finish of the Snapper and the belt are a rich black that looks even and quite appealing to the eye. The Snapper fits closely to the body making it easy to conceal the holster under a modest cover garment like a jacket or a heavy weight shirt. With a shirt you will find that it prints a little when you bend over, which is to be expected. The holster has a slight 15-degree cant forward and features a sweat guard that keeps the upper portion of the pistol, in my case a Glock 19, from contacting your body. This is a feature for comfort and also to keep sweat from contacting your firearm, which can cause corrosion. I've carried the holster now for four months and have come to really appreciate the comfort, quality and utility of the Snapper. With the 15-degree forward cant I prefer to wear the holster at the 4 o'clock position, just behind my hip, on my strong side. This allows for quick and easy access and also allows for good concealment. 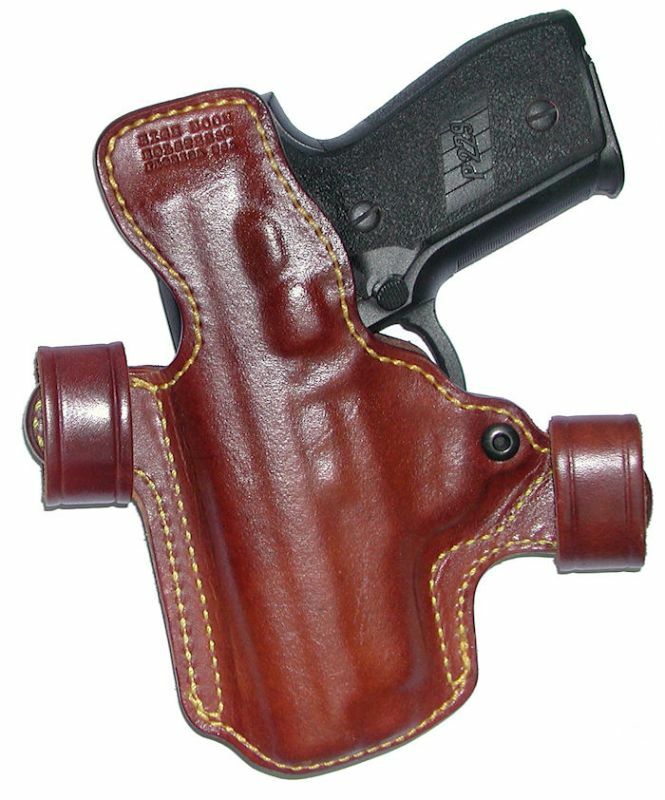 Because the leather is thick and fairly rigid, the pocket of the holster remains open for easy re-holstering. The signature feature of the Snapper are the two straps that secure the holster to the belt. The snaps are directional meaning they will only lock or release if pressure is applied from the proper direction. The snaps can't accidentally be released; it requires a conscious effort to release them. The straps allow you to quickly remove the holster or mount the holster without much effort. The Snapper even allows me to remove the holster while seated in my vehicle. As with any quality leather holster the Snapper required about 50 draws and a few days of carry to break in properly. Until you break a leather holster in it might seem a little too tight and perhaps difficult to draw from. Once broken in, like a good pair of leather shoes, the Snapper offers a perfect grip with just the right amount of retention. Overall I'm very pleased with the quality of the Snapper holster and belt. The price of $164.95 for the Snapper may seem a bit on the high side until you consider the quality of the materials and construction of the holster. High Noon Holsters have the look and feel of a custom-made leather holster, which to me is worth the price. If you're in the market for a quality made holster I would recommend that you take a look at High Noon Holsters.